1 This large size casual business loafer shoes simple shape, smooth lines, with any clothing enough to see the atmosphere, any occasion can be worn. 2 High-quality wear-resistant polyurethane elastic soles, so that the feet when walking feel different relaxed. The material inside the shoe is breathable, and the skin fits well. It has the advantages of wear-resistant, breathable, aging-resistant and anti-smelling. 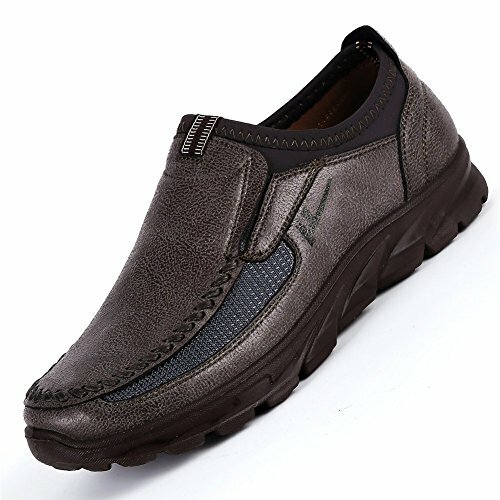 3 The upper is extremely soft and cool leather with comfortable soft breathable insole, so that your feet feel comfortable cool, soft leather can be bent at will to meet the needs of different customers, free high tightness, comfortable fit foot. Leather upper smooth easy to wash, very easy to wear. Whether it's wearing a trip or driving, or playing on the beach, it's a great choice. 4 We have 38 to 48 yards to choose from, that is, 6.5 to 12 yards. If you need a large size or you are not sure how many yards you wear, you are welcome to contact us at any time. HIGH-QUALITY MATERIALS The upper of the shoes is made of high quality genuine leather fabric, with pure cotton nitrous fabric. It is very skin friendly, soft and delicate, has natural breathability and flexibility, is not easy to break, and is easy to clean. UNIQUE The exquisite handmade suture in the upper , smooth and smooth needle thread , split the proportion of the structure of the shoe body , make the shoes three - dimensional . RELAX YOUR FEET The soles are polyurethane soles with good elasticity, so that the feet are very relaxed, and the inside is made of breathable mesh cloth to keep the feet breathing at all times. The elastic soft insole has antibacterial effect. NON-SLIP Sole concave-convex texture design, stable grasp of the ground, anti-slip wear-resistant, safe and secure outdoor sports. STRONG PRACTICABILITY It is very practical for four seasons business and leisure shoes, it is work shoes, travel shoes, boat shoes, sports shoes, Loafers shoes, climbing shoes, walking shoes, etc. Its shape can match any clothing, can let you become the focal point.